With this Expression you can move layers away from the camera (or towards it) and simultaneously scale them such that from the perspective of the camera they look unchanged. This is useful, for example, when you have an image (like a matte painting) that consists of several layers representing different levels of depth - like foreground elements, middle ground and background. With the expression you can easily distribute these layers in 3d space to give your scene some depth and to create parallax effects. For a value of 20, each layer moves 20 times as far as determined by "Offset", for 0 all layers are on their original position. 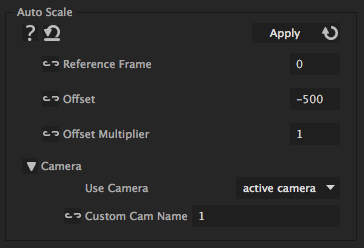 If you give different layers a different "Offset", you can still animate them simultaneously by linking the "Offset Multiplier" of all of them to the same slider control.